This German 3/4 violin by E. L. Gütter, Markneukirchen, is originally labeled and especially attractive - a highly recommended small-sized violinby this well-known maker's name suitable for good and excellent young players, featuring a strong, warm, round and even sound in equal measures as the sound of a full size instrument, with volume in the lower ranges, clarity and preciseness in the upper ranges. 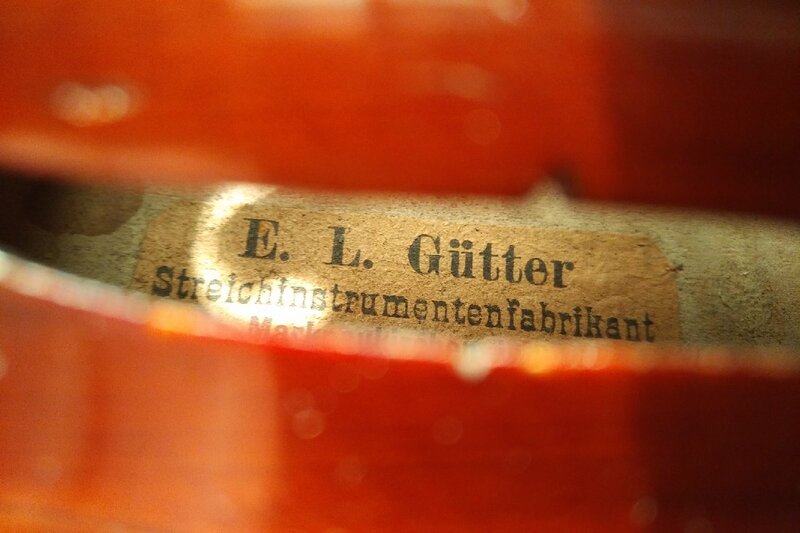 This beautiful E. L. Gütter 3/4 violin was made around 1920 following the patterns of Antonio Stradivari. The beautiful light-brown varnish, the delicate arching and edges and the attractively flamed maple of the back complete the mature and antique appearance of this rare quality handmade small-sized instrument. This 3/4 violin is of outstanding quality and without any damage in best condition. Like all instruments from us, it was carefully approved and set up by our experienced luthiers and is offered in perfect, undamaged condition, ready to play. Have a look at our trade guarantee. Order a certificate of appraisal with this 3/4 violin.